This Leawood deck is all about the details! There is a long list of reasons to consider a custom design for your outdoor living space. One of the items near the top is the time and consideration that a custom builder will give you to help identify the right structure(s) for how you want to live in your new space. Another thing a custom builder will consider is the transition areas between your home, your new space and your yard. It’s important that your Leawood deck, patio or screened porch builder blends your new space with your home and the rest of your property. We recently completed a Leawood wraparound deck. We replaced an aging cedar deck with a new, larger TimberTech deck that leads down to a pavestone patio area. The owners knew they wanted to connect their deck and patio. We created a design that has a pass-through deck area connecting the spaces. Looking for a custom, low-maintenance Leawood deck? Call on Archadeck of Kansas City! We used TimberTech Legacy Tigerwood flooring and AZEK Premier lighted railings. We also included riser lights built into the steps. The multi-level lights help ensure safety for everyone and add a touch of understated elegance in the evenings. The lights also create an easy-to-follow pathway for new guests who may be unfamiliar with the property. 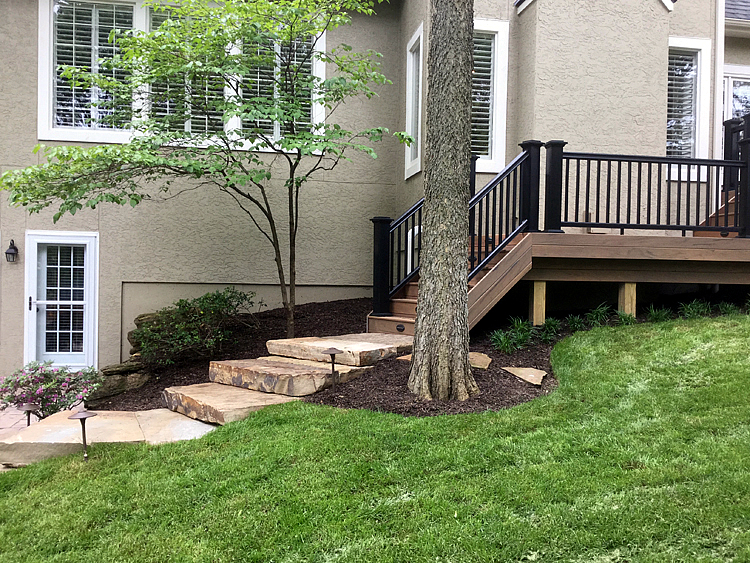 The color choices, including the TimberTech Radiance rail infill connection, complement both the exterior of the home and pick up the dark brown of the surrounding trees and mulch. As you can see from the photos, this project could easily be included in any home magazine on the newsstand. More importantly, it is going to stay looking beautiful for many years to come. The low-maintenance, fade-resistant quality of the building materials will stand the test of time almost as well as those large stone slabs we used. 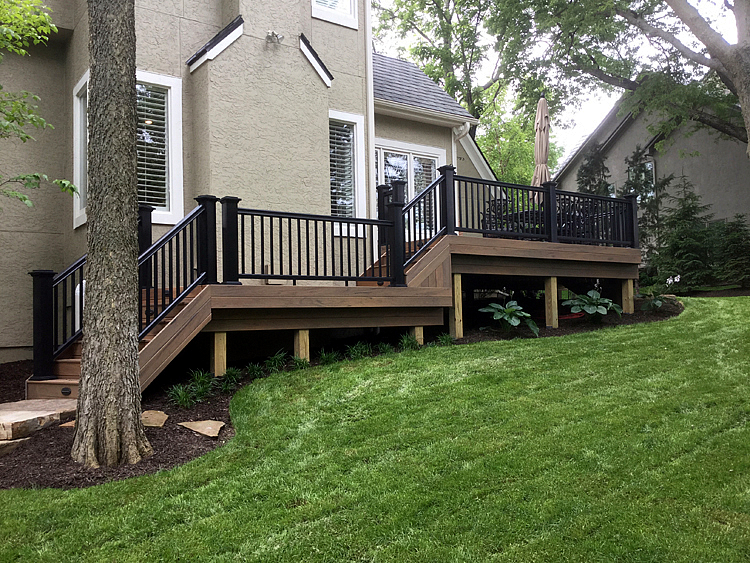 If you are considering adding a deck to your Leawood home, give us a call for a free consultation at (913) 851-3325 or drop us an email. We look forward to working with you to design the perfect new outdoor living space for your home.